The café remains open until approximately 10:00 pm. Tickets can be purchased with cash, credit cards, checks or gift cards. Tickets are available in the box office and online. What is on your café menu? The Fleur Café offers a full coffee bar, draft beer, wine, Italian sodas, and a variety of dessert bars, cakes, muffins and cheesecakes. Many of our snacks are locally made, organic, gluten-free and/or vegan. Of course, we also have popcorn, candy and soda pop! Are all menu items allowed in the theater? Of course! If you need assistance bringing items into the theater, please do not hesitate to ask. Am I allowed to bring in my own food or beverage? Sorry, but outside food and drink are prohibited at The Fleur unless previously arranged with management. Our goodies are so delicious we wouldn't want you to spoil your experience with inferior treats. Are children allowed in the theater? The Fleur asks that parents do not bring children under the age of six to the theater. (Exceptions will be made for private events and children's festivals.) Please keep in mind however, that certain films are not suitable for children. Yes! Gift certificates are available in any dollar amount and may be purchased at the box office during normal hours of operation or online. Just CLICK HERE. The Fleur offers discounts on tickets purchased in blocks of 100 or more. These are highly recommended for groups and organizations offering gifts, incentives or prizes. Tickets may only be resold for the purchase price. Contact The Fleur management at (515) 287-4545 for details. How can I reach someone at the theater? You may call The Fleur at (515) 287-4545. During business hours, a member of our staff will answer the phone and will assist you. If you call outside of these hours, please leave a message and someone will return your call as soon as possible. Yes. To help us with our busy times, please check into the MoviePass app before reaching the box office counter and have your MoviePass card ready. The Fleur is located at 4545 Fleur Drive in Des Moines. The theater is on the east side of Fleur Drive, just north of the HyVee Superstore. Reach us using the drive between Panera and Walgreens. The Fleur Cinema & Café wishes to thank you for your patronage by inviting you to join the Fleur Film Society, our free customer appreciation program. As a member of the Fleur Film Society, you will be rewarded for every eligible purchase you make toward FREE selected concession items. The Fleur Film Society is more than just a rewards program. It is a distinguished group of our most loyal patrons who are dedicated to the Fleur Cinema & Café and share a common interest in independent film. Membership includes theater drawings and giveaways, along with exclusive promotions and invitations to private events. Members of the Fleur Film Society will receive a subscription to the Fleur Cinema & Café weekly newsletter. Register for your Fleur Film Society card today! Gift cards can be purchased and reloaded for any amount and redeemed for admission tickets, snacks and merchandise. Gift cards can be purchased at the box office or CLICK HERE to purchase them online. The Fleur offers discounts on tickets purchased in blocks of 100 or more. These are highly recommended for groups and organizations offering gifts, incentives or prizes. Tickets may only be resold for the purchase price. Contact The Fleur management at 515 287-4545 for details. Purchase a large soda and/ or a large popcorn and receive same day FREE refills. We are always accepting applications for box office and concessions staff. We're looking for energetic personalities, good people skills and an eagerness to learn. These are entry level staff positions. Applicants must be 16 years or older. Please stop in and fill out an application in person. Named Des Moines's Best Overall Theater and Best Concessions by The Des Moines Register. The Des Moines Register - The Fleur Cinema and Café almost has it all: the most intelligent Hollywood films, the critically acclaimed indie films, even the occasional local film. Combine that with modern décor, a diverse menu of concessions and reasonable prices—in a refurbished space that was once occupied by a run-of-the-mill multiplex. It's clear why this locally owned theater has drawn audiences since 2001, without having to rely on blockbusters. This locally owned business screens independent, foreign and Hollywood films that Des Moines residents can't always find at a typical chain. They can also enjoy beer, wine, coffee, espresso, cheesecake, muffins, and dessert bars at the cafe. Featured by Stacey Horst as one of “Stacey's Favorites” on KCCI News 8. Stacey Horst - The Fleur Cinema & Café has it all and then some. Named Des Moines's Best Place to Catch a Flick by Cityview Magazine readers every year from 2007-2016--that's nine years in a row. Cityview, 2015 - Even though Fleur Cinema can't claim to be the only movie theater in the metro to serve alcohol, it can once again claim its title as the Best Place to Catch a Flick. The quaint theater might be smaller than the rest, but its steady following is what really counts. Cityview, 2011 - Chalk another win up for the coolest theater in town...From award-winning independents to documentaries and foreign treats, The Fleur Cinema is the theater of choice for our readers. 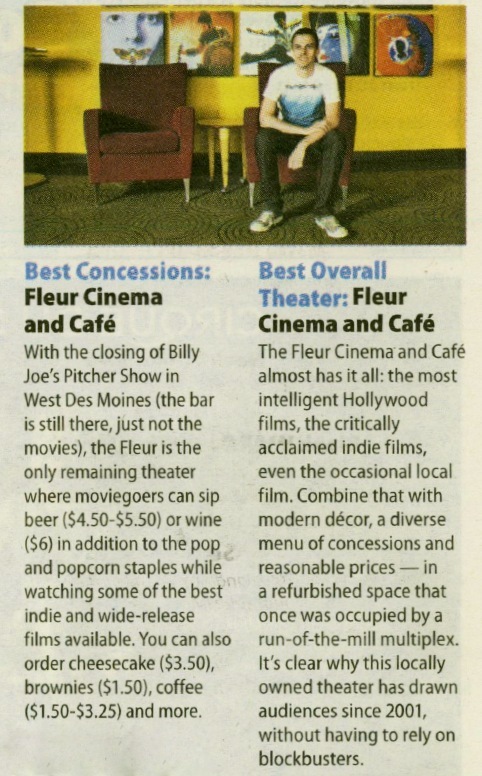 Amanda Gorsche Miller, Des Moines is NOT Boring - We love The Fleur Cinema and Café for a lot of reasons. All year 'round they are dedicated to showing smaller, independent films that you aren't likely to find anywhere else in Des Moines...There isn't a better theater in Des Moines to make you feel at home. Ben Gran, Des Moines is NOT Boring - Fortunately, The Fleur Cinema & Café is different—there are no commercials and only a couple of previews—and the previews are all for smart, sophisticated and/or foreign films, so you vicariously get to feel like a better person just for sitting through them. Going to The Fleur Cinema & Café is like giving money to NPR. Does The Fleur sell tote bags? Because I would totally buy one. The Fleur Cinema & Cafe is available for event rentals, subject to availability & category. You may rent the lobby, an auditorium, or both. Auditoriums can seat up to 272 guests. Call (515) 287-4545 to discuss availability and pricing for movie theater rentals.